IN September 1969 Lisburn housewives waged a private war. Without much fuss or bother they had been saying 'no' to goods produced in the Republic of Ireland. Leading grocers in the town reported increased demands for Northern Ireland products. Weekly orders in some shops were headed No Eire goods please. And one leading grocer declared "We must oblige our customers". The commodity most affected was butter. All the main shops in the town centre had been forced to cut their supplies drastically. Crazy Prices Ltd. the largest supermarket in town at the time declared a drop of 35% to under 15% in butter. LISBURN was to lose on of its main hotels, the Woodlands, in September 1985. The Star reported the hotel was in the process of being bought by a construction company. The Woodlands first opened as a hotel on the Belfast Road more than 20 years before, and was described as 'an institution'. The buyers were Mirvan Construction Ltd, Crumlin who were to provide upmarket housing on the site. With the sale agreed in principle, Sales Managing Director John Doonan confirmed: "The site will be developed into good quality four bedroomed-detached houses." 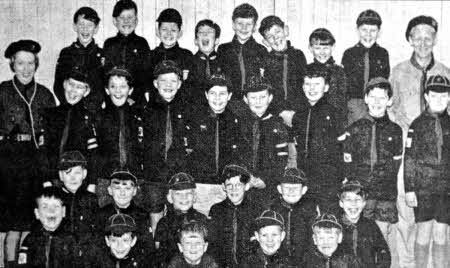 First Dunmurry Cub Pack pictured in July 1966. Recent reports of the discovery of the old Lisburn Football League's Sloan Cup prompted this photo from a reader. 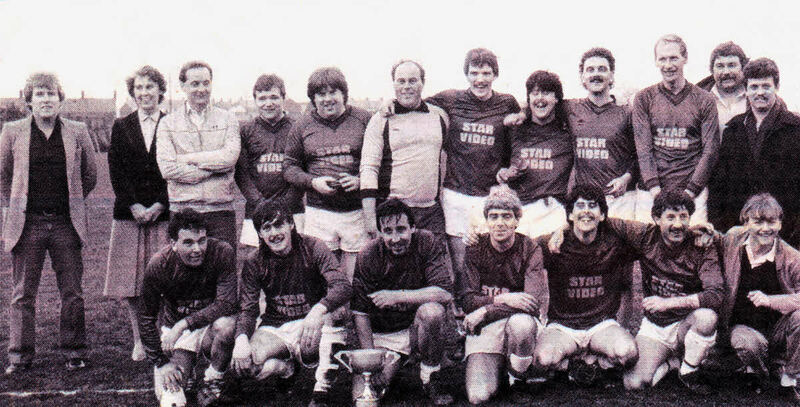 Greenwood Football Club are shown celebrating after winning the Sloan Cup in May 1986 having beaten Co. Down Rangers 2-1 in the final. Back row left to right: Cohn McCutcheon (Secretary), the late Mrs. Muriel Sloan (Donor of Cup), Roy Sloan (Manager), Emmit Beeton, the late Michael Kingsmore, Desmond O'Neill, Ernie Cree, Brendan O'Neill, Stephen Scott, Tom McClintock, John Thompson (Chairman), Ken Reid. Front row left to right: Jim Gowdy, Tony Kingsmore, Gerry Murphy, John Totten, Martin O'Neill, Ray Porter and Gary Gibson. LISBURN Borough Council had taken major steps to make Lisburn the town become Lisburn the city in January 1999. 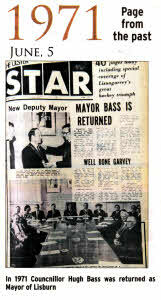 Councillors had written to the Home Office in London to express their interest in gaining city status for the town. The request was supported by Lagan Valley MP Jeffrey Donaldson who said he believed it would be in the towns interest to get city status. "1 am very hopeful that Lisburn will get city status," said Mr Donaldson. ONE prisoner was taken to hospital and a number of other prisoners and members of the Security Forces were injured during disturbances at the Maze Prison in September 1972. The outbreak of, violence lasted just ten minutes. THE Northern Ireland Housing Trust's application for planning approval for the development of land in the Ballymacash Road area for housing purposes was turned down by Lisburn Borough Council hi September 1966. The council heard a read petition signed by 226 householders in the Ballymacash and Pond Park district objecting to the Trust building there. I that in 1965 they applied to the council for planning approval for two large sites in that area. The proposals had been amended and a map was enclosed outlining the smaller area the Trust proposed to acquire. The householders in their petition said that they had been informed an application had been made for permission to erect houses in their neighbourhood and respectfully requested that permission should be refused on various grounds. The amenities of the district would be seriously affected by the erection of a large number of houses of the type usually built by the Trust, which being erected amidst the private development type of dwellings would convey an unfavourable impression to visitors. Meanwhile, a large number of homes were occupied by elderly residents who felt that the present peaceful atmosphere might well be destroyed.